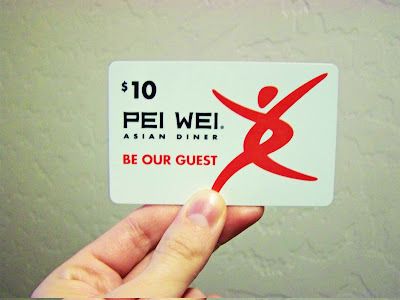 Mom, the Intern: Pei Wei FTW! Last Friday evening (also my half-birthday), Dill's parents had Bubby over for their traditional birthday sleepover, which they kicked off with Cars 2 at the dollar theater, dinner at Sbarro and a little shopping trip. Posh life, I know. Since we were down to just one kid, Dill and I bravely decided we would all go to Pei Wei for dinner. I know, you're like, "You only had one kid and you still had to mentally and physically prepare for dining out as if you were instead jumping out of a moving train?" To which I answer with an emphatic YES. Have you ever taken a food-chucking toddler who will only eat breads, dairy products and sugar to a restaurant? Let me just tell you -- if not, you haven't lived. Anyway, we showed up to Pei Wei and ordered our food (while Smush screamed to be put down so he could run amok) and then took our seats. Me, being a smarty and a possible food hoarder, grabbed a handful of free fortune cookies to quell the raging beast. It pretty much worked. Then, our entrees came out. I have no idea what was going on in the kitchen -- maybe one of the cooks got dumped earlier? -- but my food uncharacteristically SUCKED that night. The rice was, like, dry and even crunchy. And the tofu was just sicknast. And of course, to make matters worse, my son refused to eat anything but the crunchy white rice and fortune cookies. Every mushroom, carrot and broccoli spear I offered him ended up on the floor in a matter of nanoseconds. I was getting super ticked and stressed out and GOSH DANG IT MY FOOD WAS SUB PAR and I paid a fair amount of hard-earned American dollars for it. But hey, at least we only had the one kid! Silver lining! "Happy happy half-birthday to me (to me!). 24.5 Whoop whoop." "In celebration, I had a mediocre dinner @PeiWei. Rice was dry and crunchy, tofu was dry. :( I usually love it. #sadday"
I really thought that would be the end of it, but no! Pei Wei is awesome. And besides having delicious food (normally), they also have quite amazing customer service. "@momtheintern I'm sorry! Which restaurant did you visit? Can we make it up to you?" I then told them the location and they asked for my address in a direct message. Pei Wei! I could kiss you! 2) Good customer service goes along way. Thanks for being a pal, Pei Wei! I'll be back (minus the pint-sized food-flinger this time). Too bad this didn't work for me at Cafe Rio. I haven't gone back. Sweetness! I love a business that knows how to take care of a customer. One time at Pei Wei the service was awful!!! I should of tweeted then!